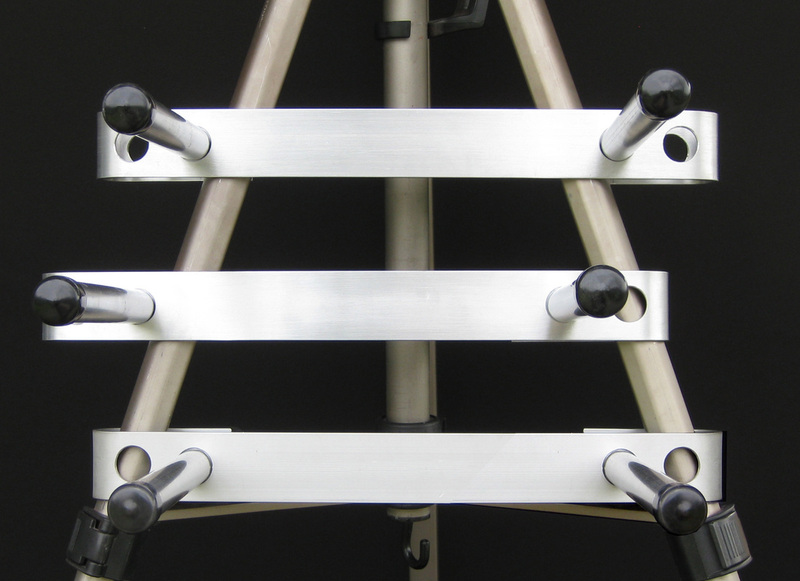 On my FeatherlitePro 190 easel, when I am standing, the lowest level for Max is 86 cm or 34 inches from the ground and the highest level stands 104 cm or 41 inches off the ground. Keep in mind that each measurement is dependent on the slope of individual easels. If you paint sitting at your easel, the height of Max can be altered by using any of these configurations and shortening the legs to a comfortable working height for you as you can see in the first photo of Cathy in the Exposé Gallery. Jann's photo in the Exposé Gallery shows her making use of a Cullmann tripod with the addition of Max as an accessory shelf. By using the top configuration here, she was able to raise her tray much higher off the ground. Max mounted in front or to the side? If you already have a particular set-up that you are already in love with, Max can make a useful addition. 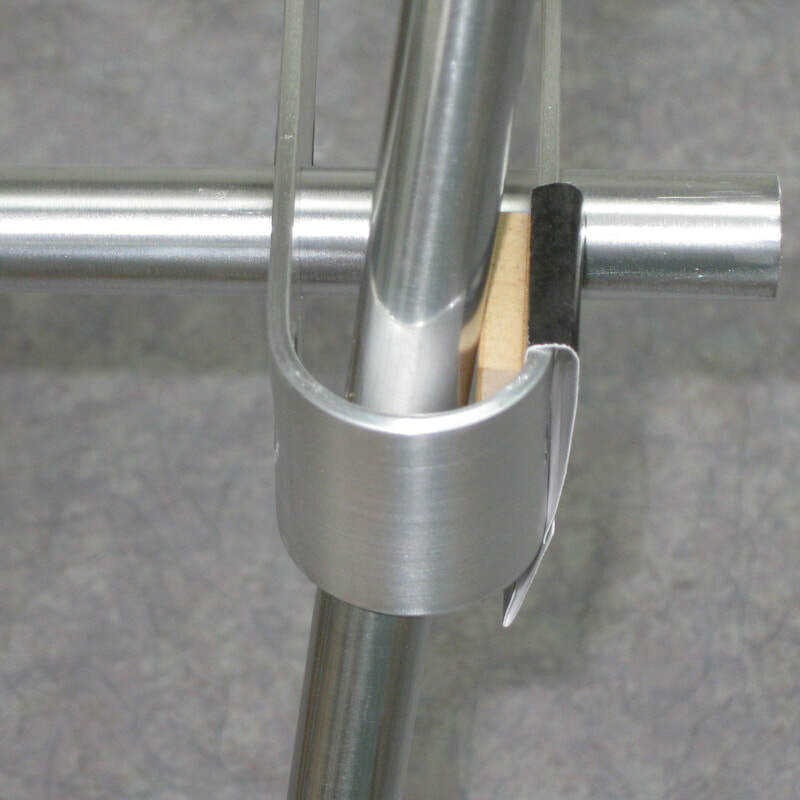 Since most art easels are not made to have a great amount of weight attached to just one side of them, you are strongly advised to attach a counterweight to whichever leg on your easel is opposite to the two legs supporting Max. The lower the better as long as your counterweight is fully suspended and not touching the ground. A large bottle of water is a terrific counterweight and disposable for the trip home or....if you prefer a good wine, you can sit back and consume it while admiring your latest creation. Our counterweight bags are a great size for this and have a handy cord and clip for circling the leg but any bag will do. If your are using a pastel travel box and planning to use the pastel cover boards that come in it as a shelf to support your box, we suggest sticking at least 4 bump-ons onto one of those very slippery boards. Placing one bump-on near each corner will provide a surface with better grip on which to set your pastel box while the memory foam on the other side is a great non-slip surface for both stacking the boards and adhering to the butler. Bump-ons are available through your framing shop or on our product page. If your easel or tripod has legs thinner than 1 inch or 250 mm you should consider whether or not it can withstand the weight of a heavy pastel or paint box. Some easels like the Italian easel are plenty strong but others might have weaker clamps for adjusting the legs which can give out under load....oh no...not my fragile pastels!! Very thin legged easels can also cause the arms to droop or slant downward. Shortening the back leg usually works as a fix. We do make custom Easel Butlers, often at no additional cost, if you need something shallower than Max but if you just love the easel you have or perhaps want to be able to use Max on more than one size of easel, then you might consider making yourself a couple of wood or plastic blocks to take up the extra space between the thin legs and the butler. One can also slip in a wedge but they tend to work their way out when least expected. Below are some photos and a diagram showing how to make a simple block that is easily removed when storing the arms back inside the butler.